Succulent chicken with fresh mango and prawns on a bed of salad leaves. This is a modern Englishdish for 4. For the mixed salad leaves choose what is in season, watercress and rocket are good. Use enough to cover four salad plates. Peel the Mango and slice the flesh into strips. Allow the prawns to come up to room temperature. Poach the chicken in white wine. (Place the chicken breasts in a saucepan, just cover with white wine, bring to the boil, add a lttle salt and pepper. Once hot, cover and simmer for 25 minutes until the chicken is cooked through). Once cooked, allow to cool. Slice the cooked chicken into decorative strips. On a plate per person, arrange the salad leaves as a "green bedding". 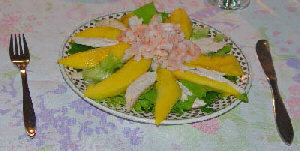 Place the chicken and mango strips in a star and make a little pile of prawns in the middle. Squeeze a lime juice quarter over each dish and provide an extra lime quarter per plate. Serve with a crusty role and butter, and a glass of FAIRTRADE white wine for a delicious light meal.